Asus ROG Phone VS Razer Phone: The rivalry between two Gaming giants. We all knew it was only a matter of time before Asus manufactures their own gaming smartphone. Ever since Razer released the first gaming smartphone, the need to manufacture more gaming smartphone has risen exponentially. Razer and Asus are among the key players when it comes to PC gaming. And it’s good to finally see them battling it out in the smartphone world. The gaming smartphone from Asus is called Asus ROG Phone. A smartphone that is said to beat every other gaming smartphone out there. The Razer Phone will forever be the first gaming smartphone. Although other companies will get the chance to produce even better devices, it still doesn’t mean the Razer Phone is bad or outdated to purchase. So let’s check out the Asus ROG Phone against the Razer Phone. The Asus ROG Phone measures 8.6mm thick and weighs 200 grams while the Razer Phone measures 8mm thick and weighs 197 grams. In my opinion, one of the disadvantages the Razer Phone has in terms of design is how ordinary it looks. The Asus ROG Phone, Xiaomi Black Shark, and ZTE Nubia Red Magic all feature cool gaming design body. While the Razer Phone looks like our everyday smartphone. The fingerprint sensor is side mounted on the Razer Phone and rear mounted on the Asus ROG Phone. The Asus ROG Phone and Razer Phone features a dual rear camera set-up at the top left. You get a front glass and aluminum unibody for the Razer Phone. While the Asus ROG Phone offers a front and rear Corning gorilla glass with aluminum frame. Sadly, there are no body color options for both smartphones. They come in only the Black body color option. The Asus ROG Phone features a 6.0 inch AMOLED panel, 76.9% screen-to-body ratio, 1080 x 2160 pixels resolution, an 18:9 aspect ratio and 402 PPI density. 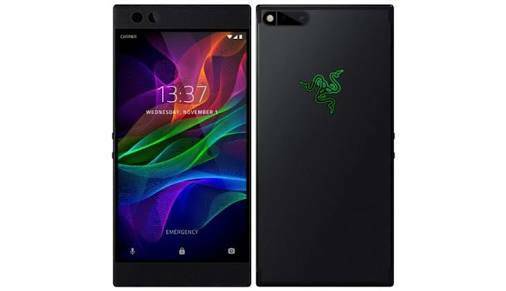 While the Razer Phone features a 5.7 inch IGZO IPS LCD panel, 72.7% screen-to-body ratio, 1440 x 2560 pixels resolution, 16:9 aspect ratio and 515 PPI density. The higher resolution on the Razer Phone should help against the AMOLED panel on the Asus ROG Phone. The display of the Asus ROG Phone sports 90Hz refresh rate, 108.6% DCI-P3 color gamut, Wide Colour Gamut, and HDR display. While the display of the Razer Phone sports Wide Colour Gamut and 120Hz refresh rate. 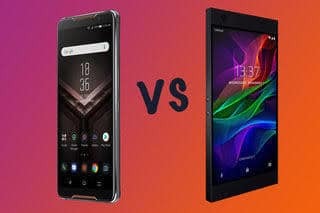 Asus ZenFone Max Plus (M2) VS Asus ZenFone Max Pro (M2): Which One Will Perform Better? The Asus ROG Phone features a dual rear camera made up a 12MP primary sensor with an 8MP secondary sensor. For selfies, the ROG Phone is equipped with an 8MP shooter. While the Razer Phone features a dual rear camera set-up consisting of two 12MP sensors. The primary sensor has a f/1.8 aperture while the second sensor has a f/2.6 aperture. Just like the Asus ROG Phone, the Razer Phone comes with an 8MP front-facing camera and f/2.0 aperture. The Razer Phone was released last year, which is why it’s powered by Qualcomm Snapdragon 835 chipset clocked at 2.35GHz coupled with an Adreno 540 graphics processing unit. While powering the Asus ROG Phone is Snapdragon 845 chipset clocked at 2.96GHz with an Adreno 630 graphics processing unit. The GameCool vapor-chamber cooling system is featured in the Asus ROG Phone. While Razer has failed to announce if the Razer Phone features a cooling system. But it’s likely the smartphone does. Running on the Razer Phone is Android 7.1.1 Nougat upgradable to Android 8.1 Oreo, 8GB memory and 64GB internal storage. While on the Asus ROG Phone, you get a ROG Gaming UI skin on Android 8.1 Oreo, 8GB memory and either 128GB or 512GB internal storage. Razer Phone supports microSD up to 400GB while the ROG Phone doesn’t. Anything less than a 4000 mAh battery for any gaming smartphone should be considered a failure. Both the Razer Phone and Asus ROG Phone packs the same non-removable Li-lon 4000 mAh battery with quick battery charge 4.0+. The Razer Phone costs around $700 (N245,000) while the Asus ROG Phone does not have an official price yet but should be sold for around $790 (N276,500). With the new amazing features the Asus ROG Phone is bringing, it has to be the best gaming smartphone out there and clearly beats the Razer Phone in every aspect.